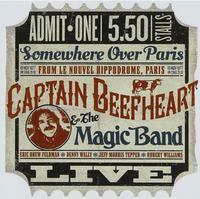 This double disc set has some great live performances from Captain Beefheart and his Magic Band. The sound quality here is better than on some of the more recent releases. It still sounds a bit bootleg-like, but it’s better in terms of sound than that might convey. It has some smoking hot music, too. This instrumental jam is bass heavy, noisy and almost metal. Another instrumental, this is proggy, jazz like and a lot more. It works through several shifts and changes in a fast paced and dynamic arrangement. This noisy rocker is a bit raw, but has a lot of cool built into it, too. I love the almost funky vibe to this. It’s a lot of fun. There is a lot of blues on the table here. Harmonica adds to that. This is a quirky little beast. That’s for sure. Some things here even make me think of Hawkwind a bit. The weird jam at the end is quite cool. It’s part prog and part blues and all bizarre yet effective. Crazed stuff that’s one part Frank Zappa and one part King Crimson opens this. It works to more of a straightforward song from there. Still, this is Captain Beefheart, so it’s only going to be so straightforward. Jazz, progressive rock and more merge on this powerhouse rocker. It’s one of the coolest pieces of the set and has a killer instrumental section mid-track. A crazed guitar solo piece, this has a real free-form prog vibe. There are definitely nods to King Crimson and Robert Fripp. It’s a noisy one. This is just a short poetry bit. Part acapella song, part poetry reading, this is art rock for sure. Well, the rock part could be in question. A bit of a soulful rock and roll vibe permeates this bouncy rocker. It’s still got enough weirdness to get into prog territory. This high energy hard rocker is quite a cool tune. It’s one of my favorites of the set for sure. Here we’ve got more of a bluesy number. This is good stuff. I like the bass and the harmonica on this one. Spoken bits punctuated by sections of seemingly freeform music is the concept here. This is art rock, for sure. It’s also oddly effective. This song is really electrified. It’s a screaming hot tune with a lot of classy prog elements and more built into it. This jam is definitely progressive rock. There is a lot of old world melody built into it. It’s a fairly short instrumental. A standard blues grind brings this thing into being. That mode holds the cut all the way through. This is a cool hard rocker. It’s pretty typical Beefheart – assuming there is such a thing. Weaving this way and that, this is crazed and quite free form. It’s part jazz, part prog and all cool. Another dynamic cut, this has a lot in common with Zappa. This feels somewhat similar to the previous cut. It’s a screaming hot number that lands among the highlights here, though. It has quite a few shifts and turns. The closing section is particularly strong. This hard rocker is more mainstream. It’s an effective piece, too. It has some great bits of guitar throughout. Just an acapella blues tune, this is short. There is a lot of blues in this. It has a lot of jazz in the mix, too. The drums really get to show off on this. The band introductions happen during the jamming on this thing. It’s aa bit off kilter and quite a great combo between rock, jazz and more. This jam is a fun one. It’s not a big surprise, but it’s good stuff. This little rocker is not something unexpected, but it’s effective.